As the ice finally melts from the mountains surrounding Lake Placid, locals and tourists alike crave adventure and excitement after one of the longest winters on record. Lake Placid in the spring is the perfect destination for your next vacation. There are a number of things to do in Lake Placid with warmer spring temperatures and stunning scenery. There are also beautiful vacation rental accommodations for groups of all sizes. People from all over the world visit the Lake Placid, New York area for its rustic charm, hiking trails, fabulous restaurants and Olympic history. We’ve narrowed down our top 5 favorite things to do in Lake Placid, New York area that you can enjoy on your next Spring vacation. This is a relatively easy hike up an elevation of 761 feet and is 2.1 miles long. The climb offers two looped trails, a long one and a short one. Depending on your climbing ability and the amount of time alloted for the outing, pick the trail that best accommodates your needs. The summit provides great views of nearby Heart Lake and the Adirondack High Peaks range. Insider Tip: Stop off at Big Mountain Deli & Creperie in Lake Placid (2475 Main St. Lake Placid) on your way to the trail and get a lunch to go. There’s nothing better than eating lunch on the top of a mountain! Don’t forget a light coat as well, it’s always colder at the higher elevation in the spring. Lake Placid, Adirondack has so many wonderful vacation rental properties to choose from, some which are within walking or short driving distance to these two fabulous tasting rooms. Goose Watch is located right on the main Lake Placid thoroughfare which provides the opportunity to shop and dine in between tasting room visits. Swedish Hill is located just down the road, best if driven to. At each tasting room, for a small fee, visitors will be able to sample several wines of their choice as well as purchase bottles of their favorites right on location. Visit our Vacation Rentals in Lake Placid. Located 9 miles east of Lake Placid, Saranac Lake is well-known for its shopping, restaurants, historic sites and amazing natural scenery. It was even voted an “All-American City” by the National Civic League. 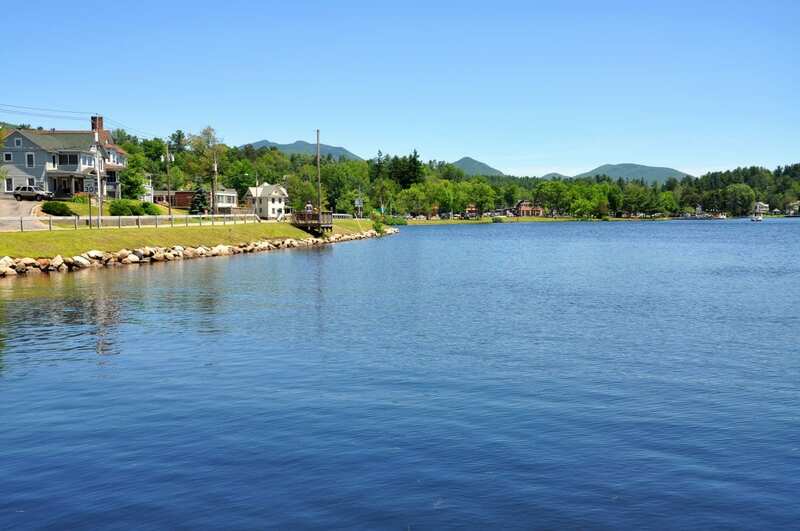 The centerpiece of the City of Saranac Lake is Lake Flower, consider taking a scenic stroll around the lake to see all of what Saranac Lake has to offer. This natural attraction near Lake Placid is a must see! Peruse some of the local shops. Visit the Robert Louis Stevenson museum or take a spin on the Adirondack Carousel while you are in town. Visit our Saranac Lake Vacation Rentals. From May 3rd to May 10th, restaurants in and around Lake Placid will be offering special prix fixe menu items for $15, $20 and $30. This is a great time to try new foods in Lake Placid, Saranac Lake, and Tupper Lake. Along with discounted menus, there will also be celebrations at the Lake Placid Center for the Arts, The Palace Theater and live music at several of the area restaurants. It’s a foodie’s dream come true! Where: See the full list of participating restaurants at Eat ADK. In the spring, visitors to Paul Smith’s VIC can enjoy walking the nature trails at the center, enjoy local artwork present at the facility, and enjoy educational speakers and workshops. The VIC is home to the Great Adirondack Birding Celebration (June 1st to the 3rd), where visitors can learn how to look for birds native to the Adirondacks, a bird festival with an artisan market and some special guest speakers. If birds aren’t your thing, bring a lunch and enjoy the VIC any other time during the springtime. Visit our Paul Smiths Vacation Rentals. Insider Tip: Beat the crowds that flock to the VIC for hiking by arriving early in the morning or go closer to dinner time. No matter where the wind takes you this spring in Lake Placid, New York be sure book you vacation rental cottage or vacation accommodations as soon as possible because people from all over flock to this little slice of heaven all year round. With so much to see and to do this spring, be sure to make Lake Placid your next vacation destination. You certainly won’t be disappointed! Save money on your next vacation rental in Lake Placid, New York. Book direct and pay NO FEES! Its really great idea about a vacation. Ilove this place for vacation purpose, this is the best place for family.